Butterflies of Singapore: The Malayan Jester - Permanent Resident? The Malayan Jester - Permanent Resident? A Species here to stay? Last weekend, we discussed the establishment of a colony of a species that had long disappeared from Singapore - the Angled Castor. 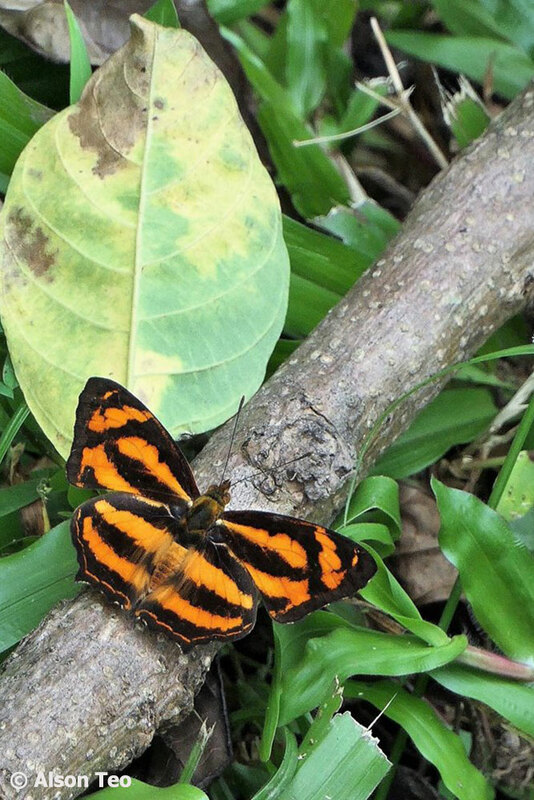 Very rare in Singapore for many years, the species made a surprising comeback and became locally common again on Pulau Ubin where its caterpillar host plant, the Castor Oil Plant, grows in abundance. 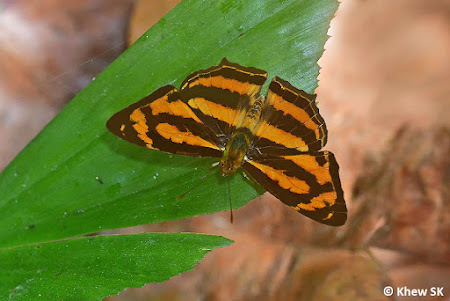 Over the past few months, another species, the Malayan Jester (Symbrenthia hippoclus selangorana) was repeatedly observed in the Dairy Farm Nature Park area, at the foothills of Bukit Timah Nature Reserve. The Malayan Jester was first recorded as a new discovery for Singapore back in Feb 2012 when a few individuals were spotted at the Nanyang Technological University area. However, no other sightings were made after that year. Recently, more sightings of the Malayan Jester were recorded, at the northern part of Singapore in Admiralty Park, and many sightings of both males and females at the Dairy Farm area. Again, the appearance of pristine individuals implied that these were not stray vagrants that came from Malaysia. It is therefore highly likely that a breeding population has now been established in Singapore. From the recent flurry of postings of the Malayan Jester on social media, this is strong evidence of a relatively healthy but small population of the species around the Dairy Farm area. 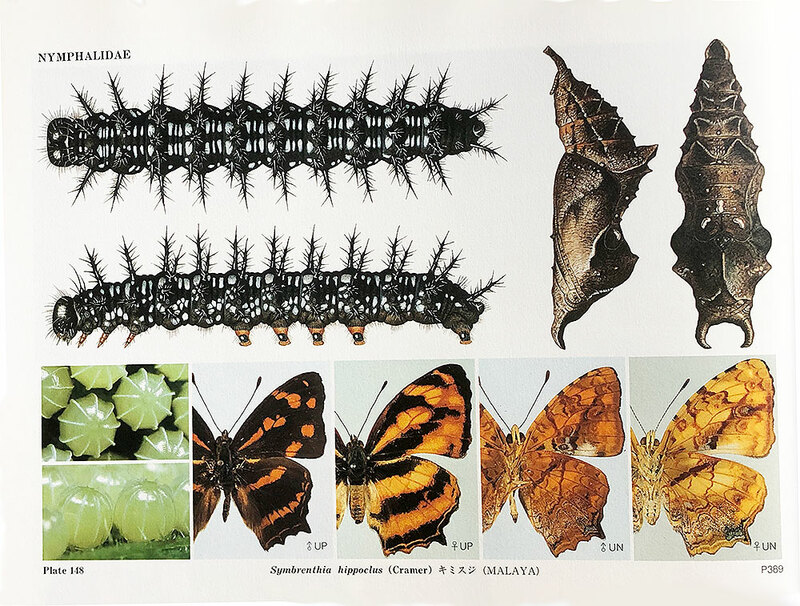 Again, has something changed in the ecology of the area, or has some species of plant that the caterpillars of the Malayan Jester feeds on, become more abundant? Between 2012, when it was first discovered, and 2018, was the species slowly establishing itself somewhere within the forests of Singapore? We probably have more questions than answers. But let us take a closer look at the Malayan Jester. 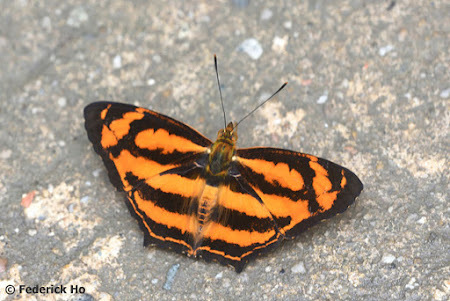 There are several species of the genus Symbrenthia in West Malaysia. The early authors did not record any of the species in Singapore. It was added to the Singapore checklist only in 2012. The cryptic species has many lookalikes and with more recent photos available, and the keen eye of Dr TL Seow, he opined that the Singapore population is S. hippoclus (Malayan Jester) and not the closely related S. lilaea (Common Jester). The life history of the Malayan Jester has been recorded from Malaysia by Igarashi and Fukuda . The host plants that they bred the caterpillars of this species on, are Boehmeria glomerulifera, Oreocnide trinervis and Oreocnide pedunculata all from the Urticaceae family. 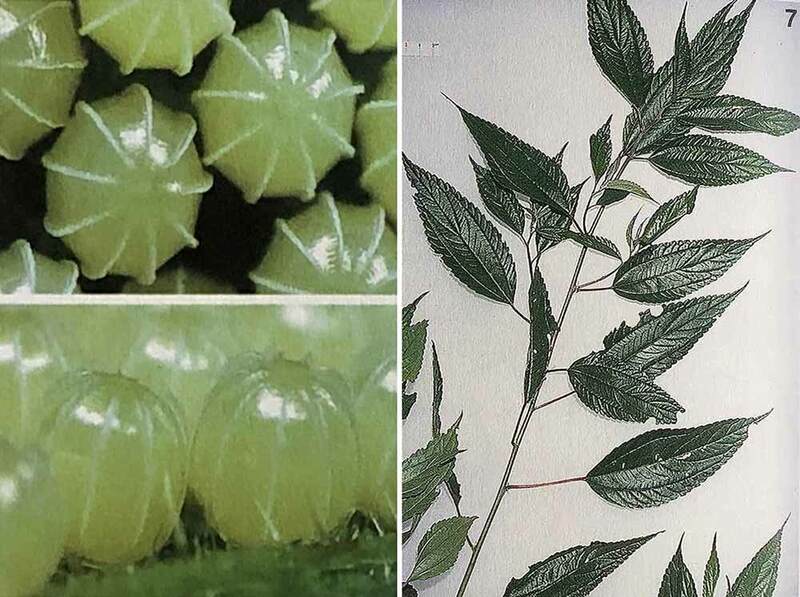 It is likely that one or all of these plants are also found in Singapore and in that location if there is a breeding population of this species. Left : Records of the life history of the Malayan Jester in Malaysia show that the female lays between 20-50 eggs at one sitting. 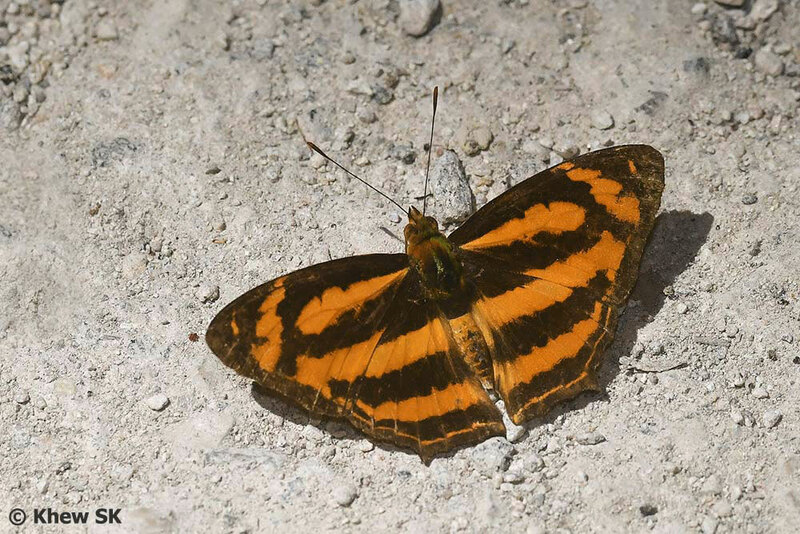 The species has been described as "common in low mountains from 700-1400m". In Malaysia, the species has been observed to lay "egg masses consisting of 20-50 ova, each laid on the undersurface of leaves. The newly hatched larvae aggregate and feed on the hostplant leaves leaving the veins uneaten in web patterns." Given that the female can lay that many eggs, the species can possibly become more common in the years to come, if there is a sustainable supply of its caterpillar host plants, and that the species is not vulnerable to predators or in-breeding problems. The Malayan Jester is black with orange bands arranged horizontally across both wings. There is a short pointed tail on the hindwing. 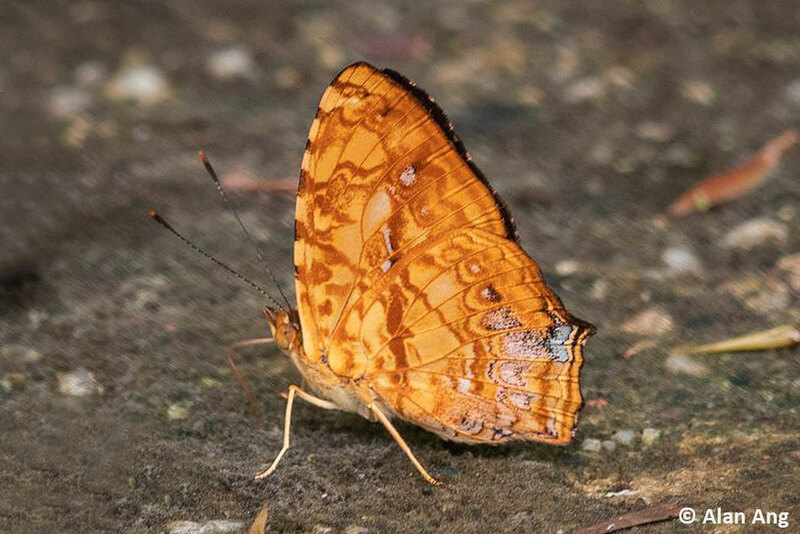 The underside is pale orange-brown and highly variegated. 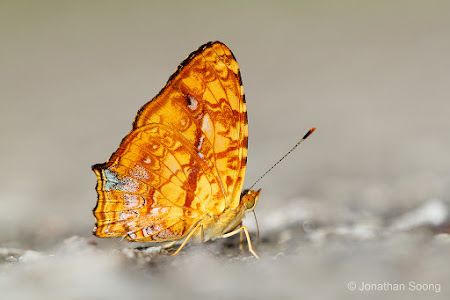 The underside hindwing is a pale purple with the post-discal area more heavily dark-dusted and more prominently marked than in the Common Jester. 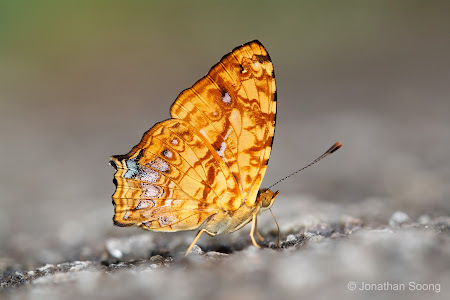 In the Common Jester, the discal spot in space 3 on the underside of the forewing is unicolourous orange in the male and very nearly so in the female, whilst in the Malayan Jester, this spot is outwardly pale pinkish in the male and nearly all pinkish in the female. 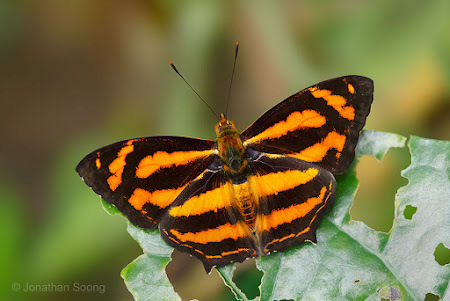 The two species are difficult to separate with the physical characteristics alone, but we will go with Dr Seow's view that this is Symbrenthia hippoclus selangorana (Malayan Jester) until more evidence is available to prove that his conclusion otherwise. 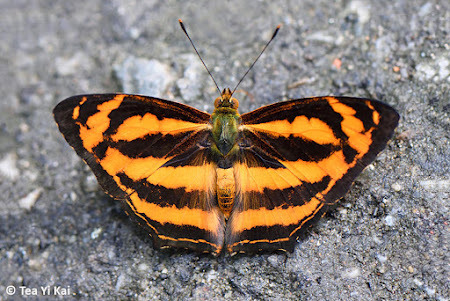 In Butterflies of the Malay Peninsula 4th Edition, it was also mentioned that Symbrenthia lilaea luciana (Common Jester) is "most often found in the hills above 3,000 feet." - making the Singapore species more likely to be the Malayan Jester, which is a lowland species. 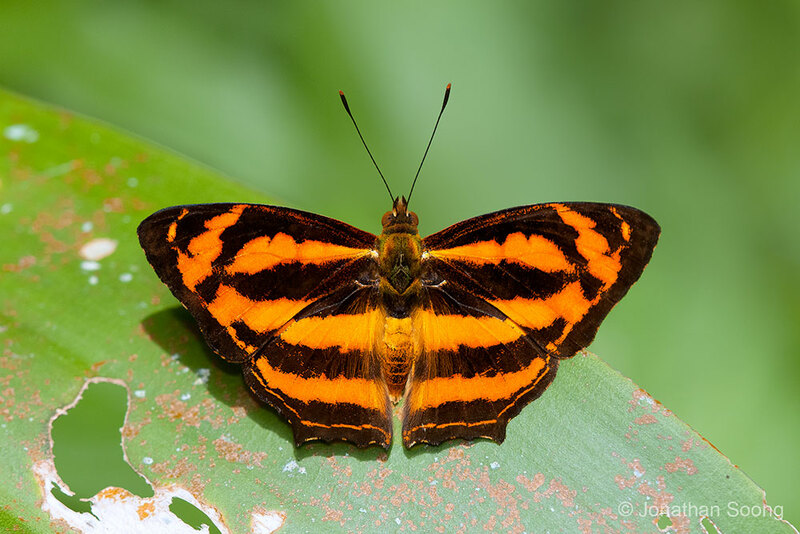 The Malayan Jester is skittish and flies rapidly. 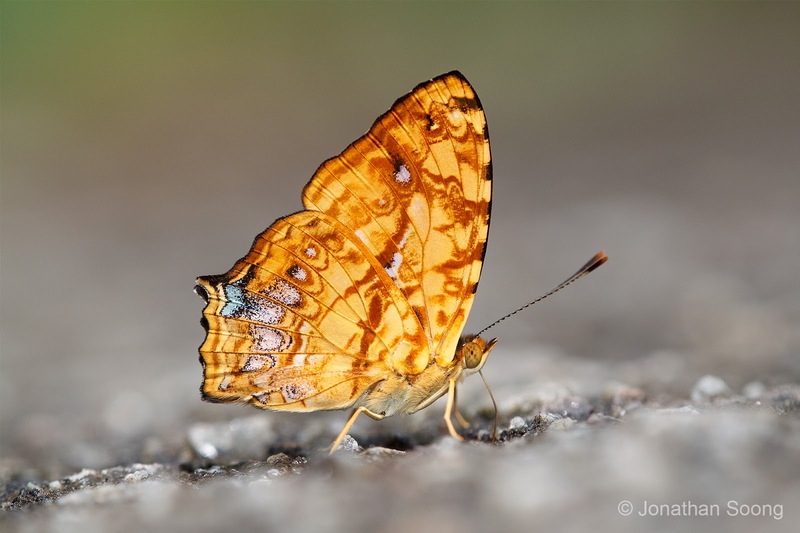 Males are usually encountered puddling at damp muddy footpaths in forested areas, whilst females are more likely observed foraging amongst low shrubbery. In the early morning hours, both sexes can sometimes be observed sunbathing on the tops of leaves with their wings opened flat. Whether or not the Malayan Jester will continue to stay in Singapore will depend on a number of variable factors. 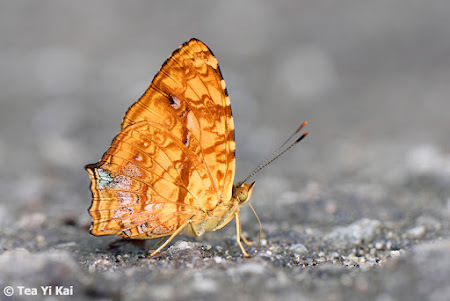 For the moment, should the status of another "very rare" seasonal migrant be amended to "moderately common" at this locality at the foot of Bukit Timah Hill, where it has been observed with regularity over the past few months? 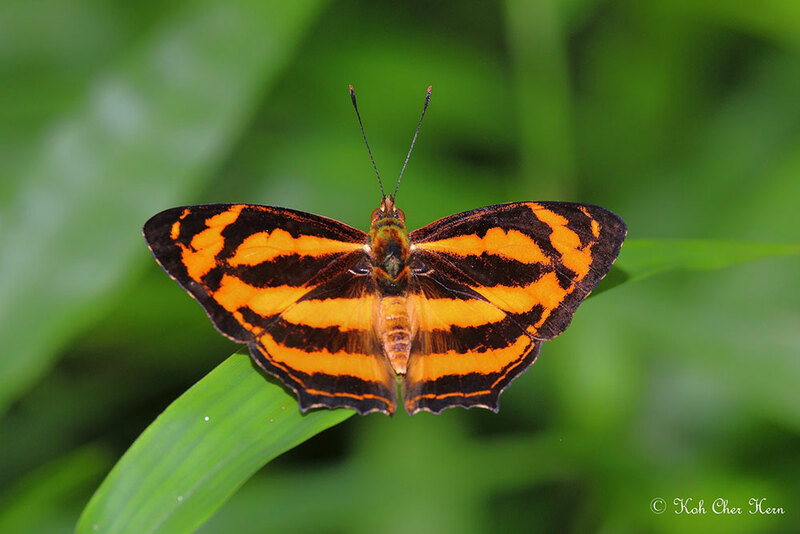 It is hoped that the early stages can be recorded and conservation action taken to sustain the colony here in Singapore.